New Jersey flexed its distance running prowess as Luis Peralta, Sean Dolan, Drew Maher and Devin Hart all reached the podium with All-American performances at Sunday's New Balance Indoor National Championships. In the 800, Peralta, a junior at Passaic, and Dolan, a junior at Hopewell Valley, pushed each other to county records in an unseeded section. Peralta, the 800 winner at the N.J. Meet of Champions, ran a Passaic County record and NJ #7 all-time 1:51.74 to edge Dolan, who crossed in a Mercer County record and NJ #8 all-time 1:51.77. In the seeded 800, two runners ran faster than Peralta and Dolan to push Peralta to third overall and Dolan to fourth. 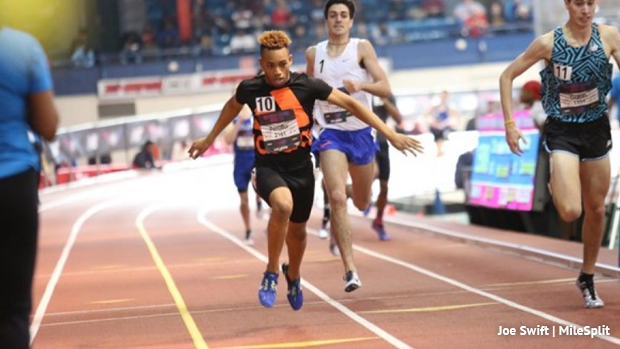 Peralta's 1:51.74 smashed the Passaic County indoor record of 1:53.76 set in 2014 by Joe White of DePaul. White placed third for Georgetown in the 800 at the NCAA Championships last June. Dolan, who also ran a leg on Hopewell Valley's runner-up 4xmile that ran 17:30.73 on Saturday, broke the Mercer County mark of 1:52.4 set in 2009 by Sadiki White of Allentown. Shore Regional's Maher, Chris Romero of Voorhees, and Pt Pleasant Boro's Hart also came up with the best times of their careers to in the mile and two-mile, respectively. In the mile, the Penn State-bound Maher, the M of C 1,600 winner last month, dropped a 4:11.10, No. 9 in state indoor history, to place fifth, and Romero ran a Hunterdon County record 4:13.66 to finish eighth. Romero missed All-American status by just two places. In the two-mile, Hart ran 9:06.58 to finish sixth. Hart, a junior, won the third M of C title of his career last month when he captured the 3,200 title. Hart also won M of C titles in the 3,200 last June, and in cross-country this past fall.